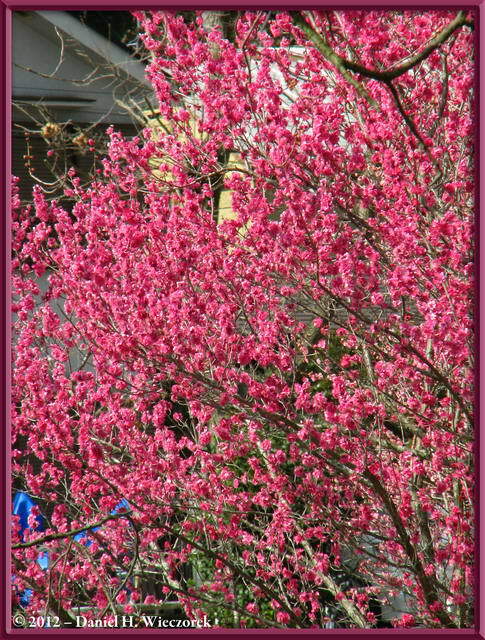 This is Page 2 of 3 - the best of March 2012! This page begins (and ends) with March 25th - our next (and final) outing of March. 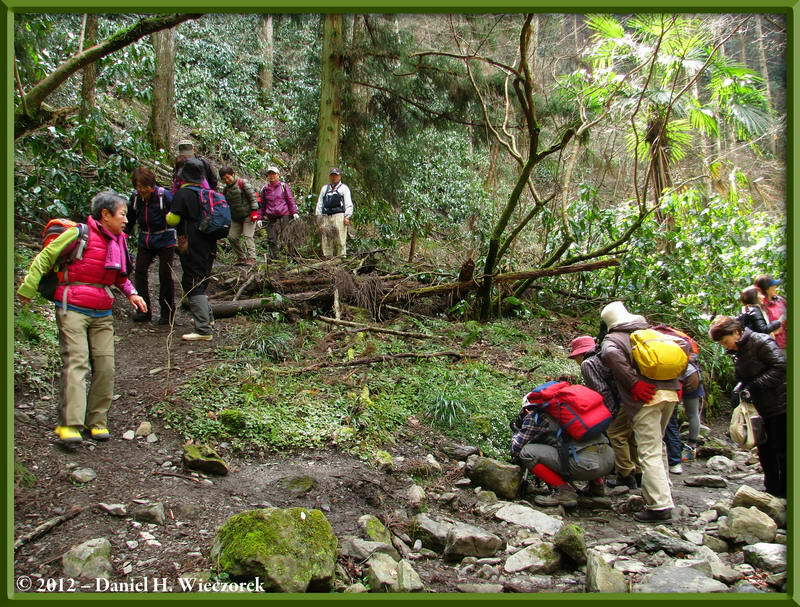 We took the train out to Takao, hiked from there to Hikage Creek, up Hikage Creek trail to Mt. 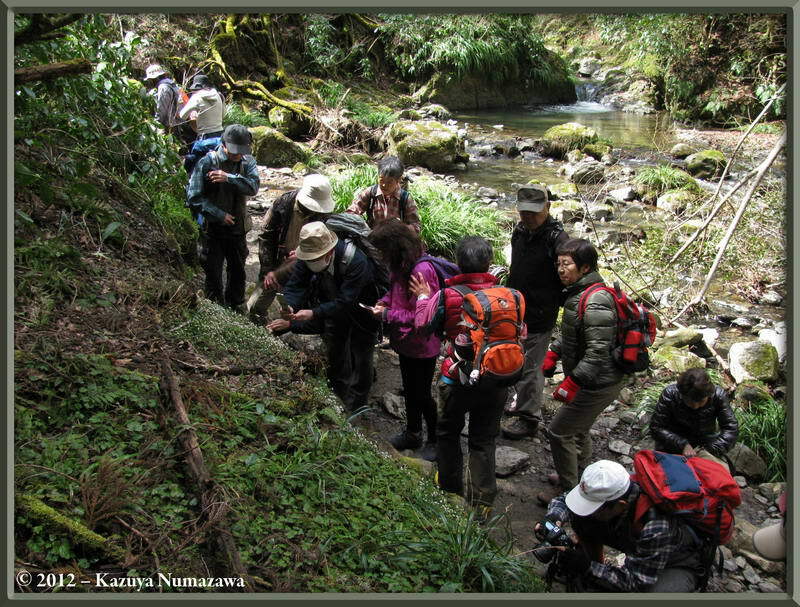 Kobotoke-shiro (670 m = 2,199 ft) for the 29th time and ate our lunch there. Then we continued from there to Mt. Takao (599 m = 1,965 ft) for the 73rd time. 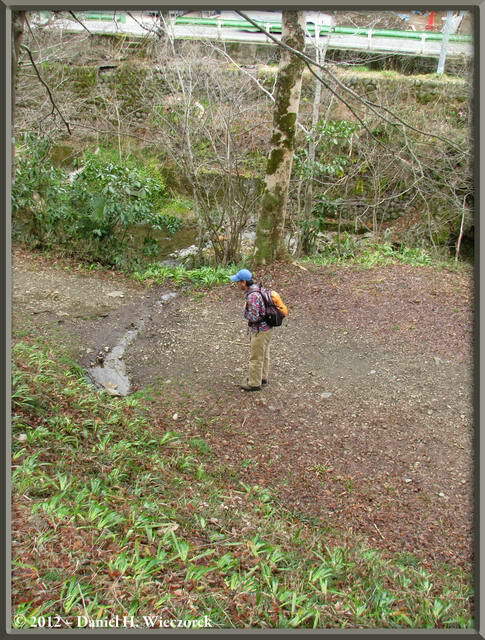 From there we hiked down trail 6 to Takao-san Guchi Station and proceeded back home. Click on any thumbnail to begin. From Takao Station we walked up the highway for a short distance and then took this trail which heads for the mountains. 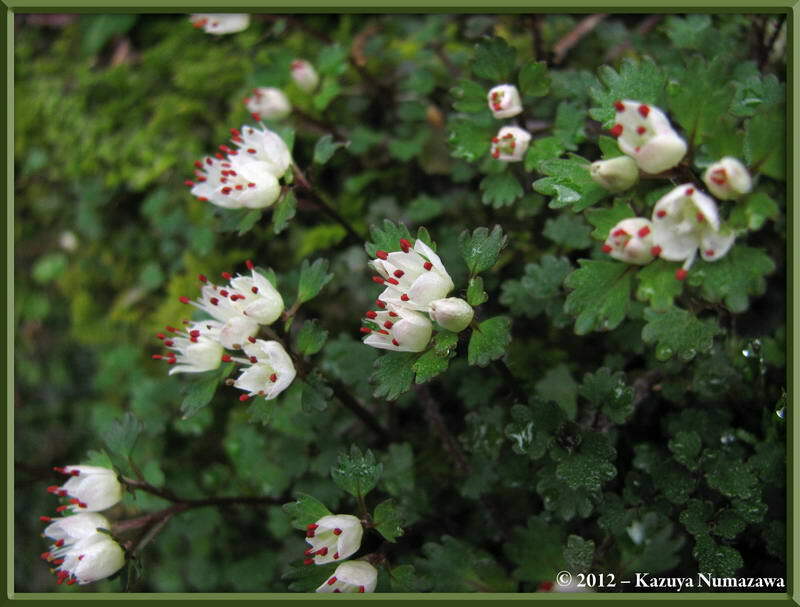 As we hiked we saw this incredible pink flowered plum tree and an abundance of Veronica (Veronica persica). 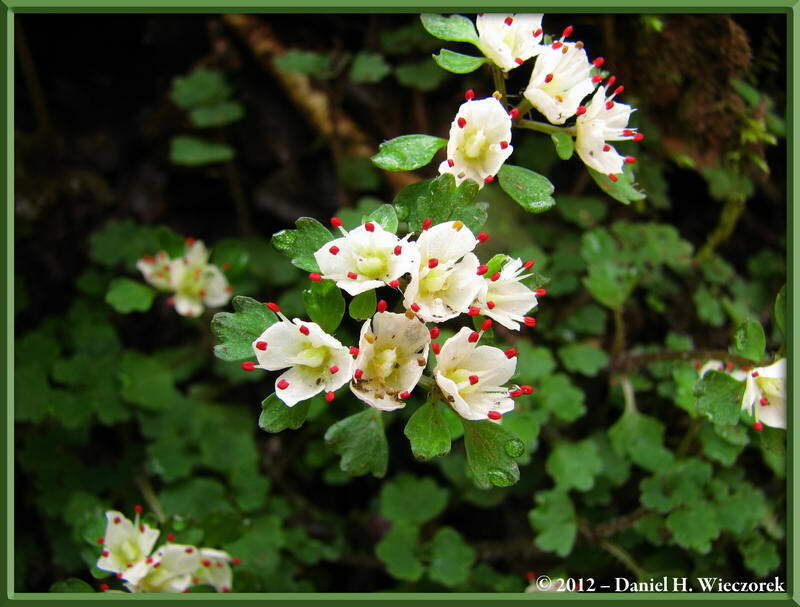 As we hiked we came upon our first spring flower which we actively search for - Chrysosplenium album var. stamineum. The 2nd photo is Kazuya as seen from the spot where I was standing. 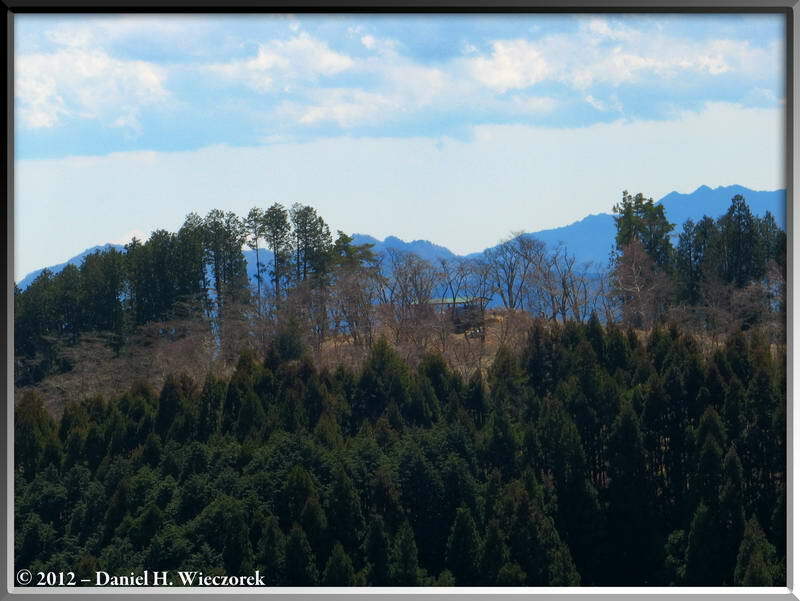 The 3rd shot is merely a mountain scenery shot, nothing special, but it looks nice. 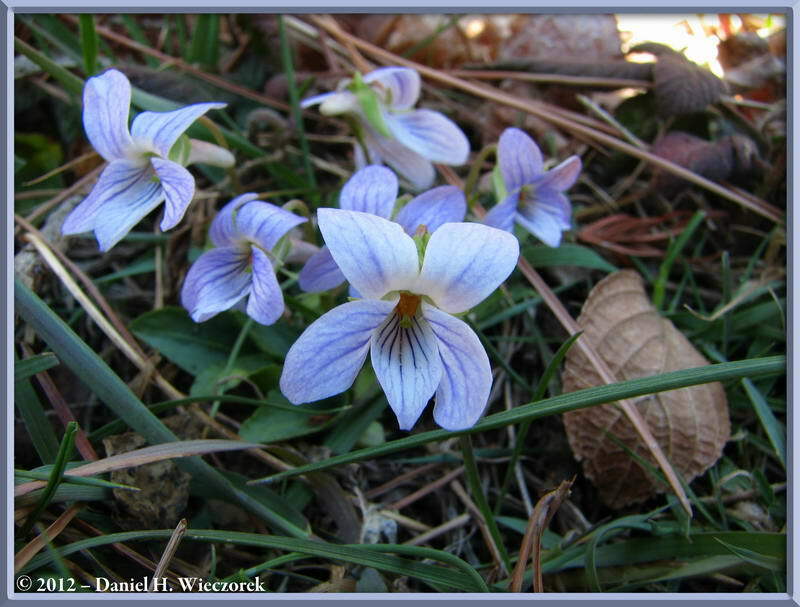 The first photo here is most likely a Viola confusa ssp. nagasakiensis. 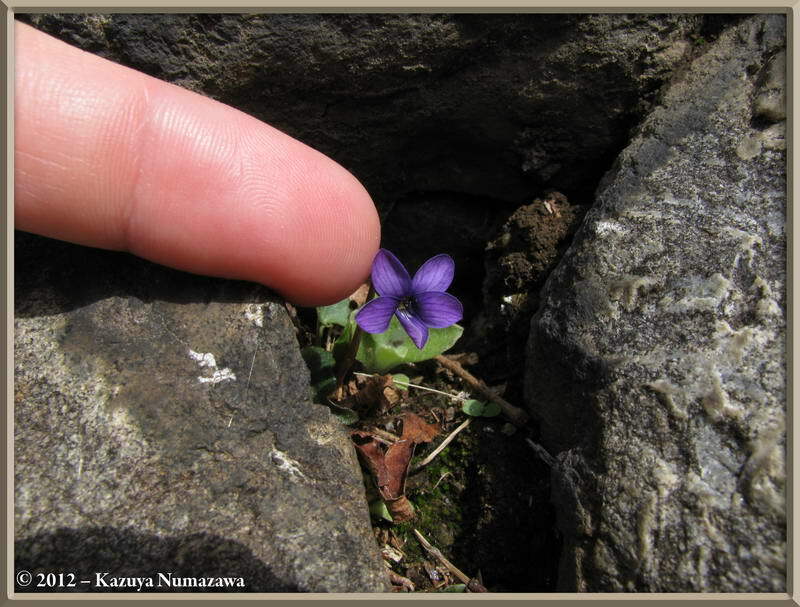 It is planted in the rock wall of a person's house. 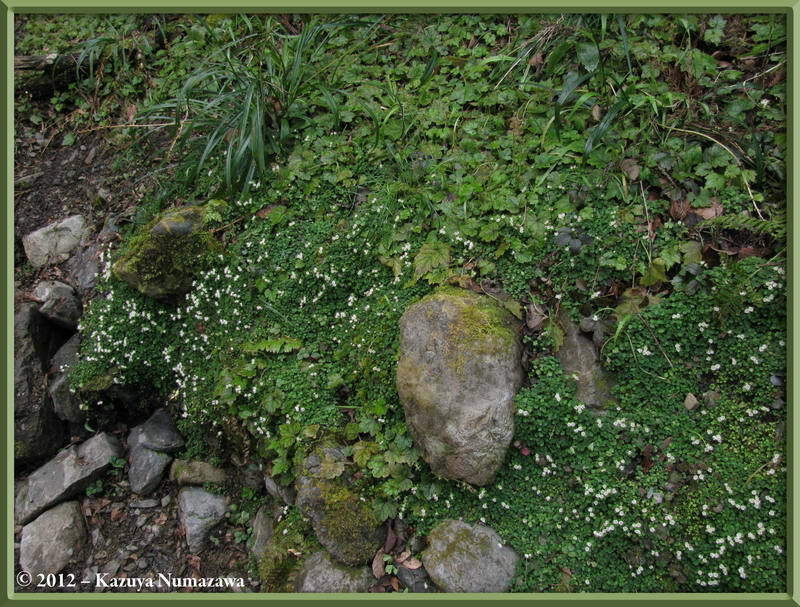 It is NOT native to this area of Japan. 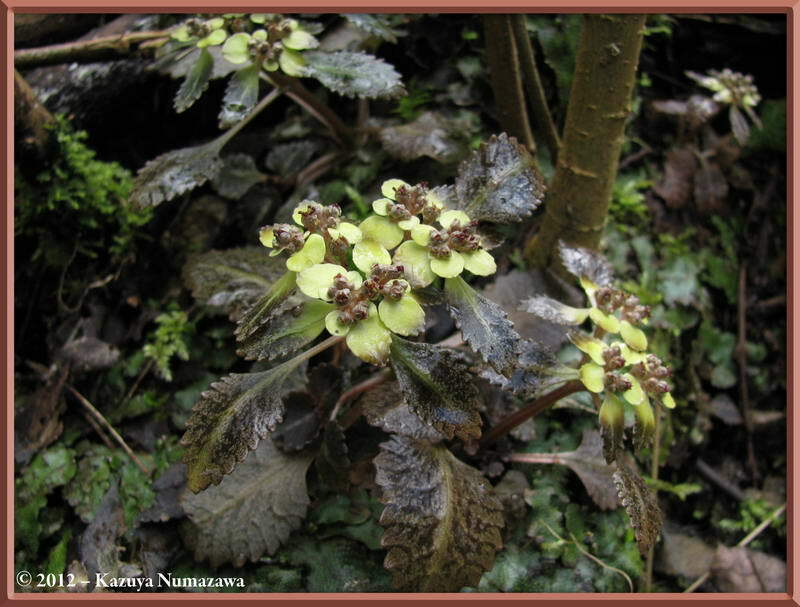 The next 2 shots are once again Chrysosplenium album var. 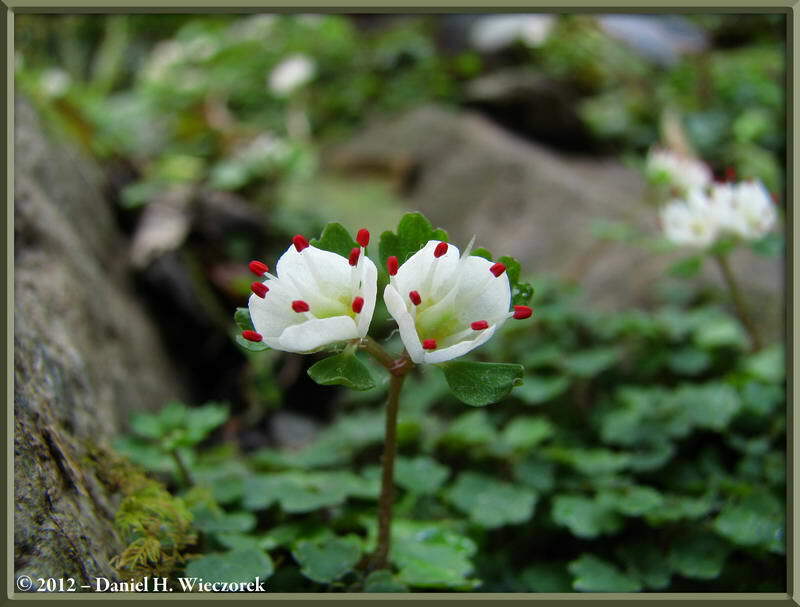 stamineum - the 3rd shot is a wonderful overview photo which gives you a good impression of how this plant grows and just how small the flowers are. 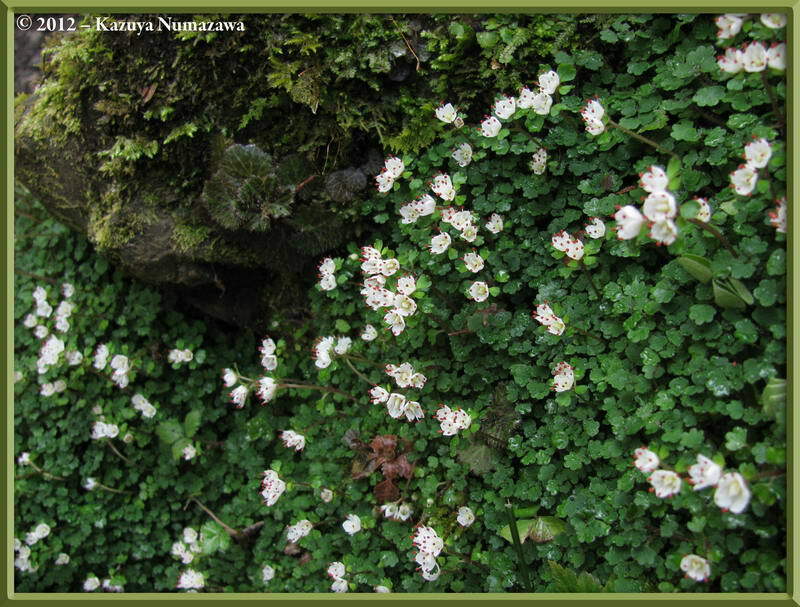 Here are 3 closer shots of Chrysosplenium album var. stamineum. 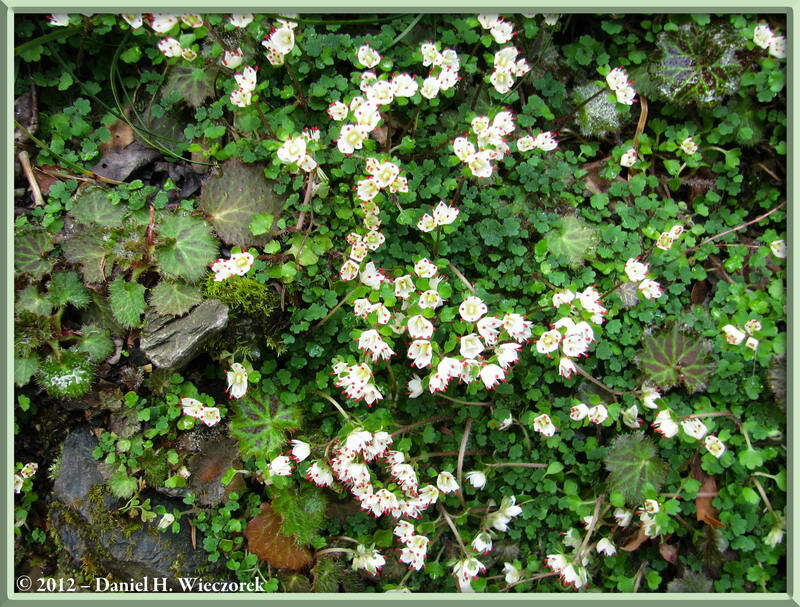 Here is a final shot of Chrysosplenium album var. stamineum and then 2 shots of a bunch of senior citizens which appeared out of nowhere. These people are so frustrating - stepping all over the flowers, not caring if there is anything left for the next person to look at. In the 3rd photo note how they are just using their cell phone cameras in an attempt to capture this flower. Damn, it's pitiful to watch these people. 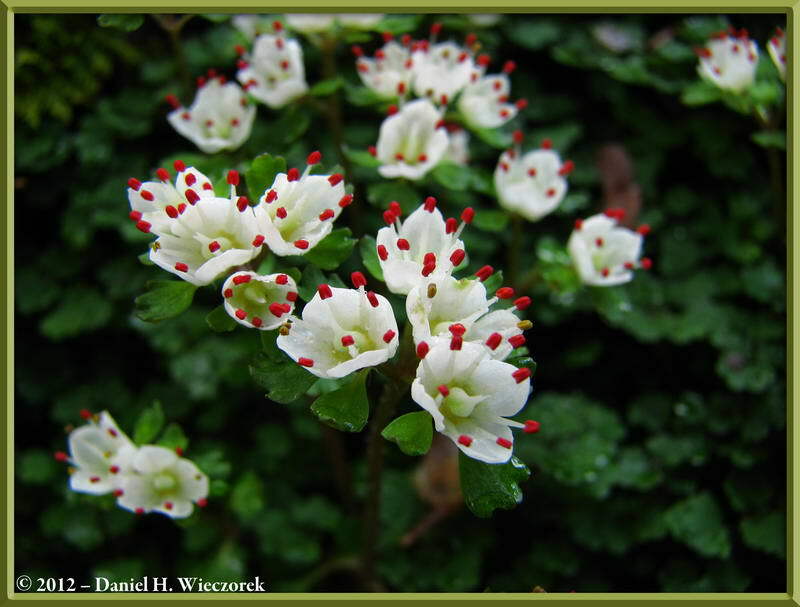 Here is a Chrysosplenium macrostemon var. 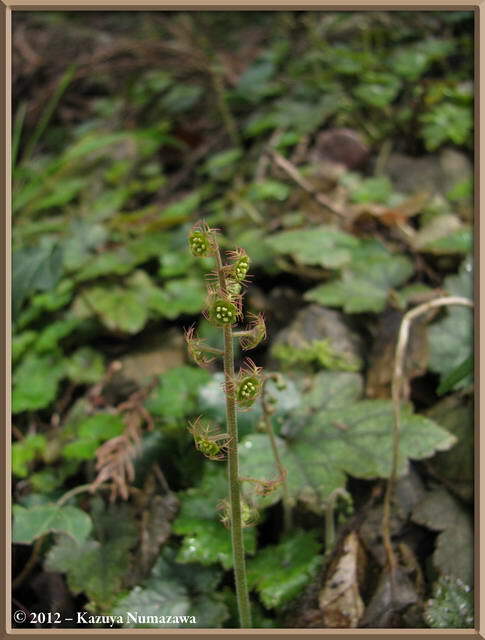 atrandrum in first position, a Mitella pauciflora in 2nd position and a Viola hondoensis in 3rd position. 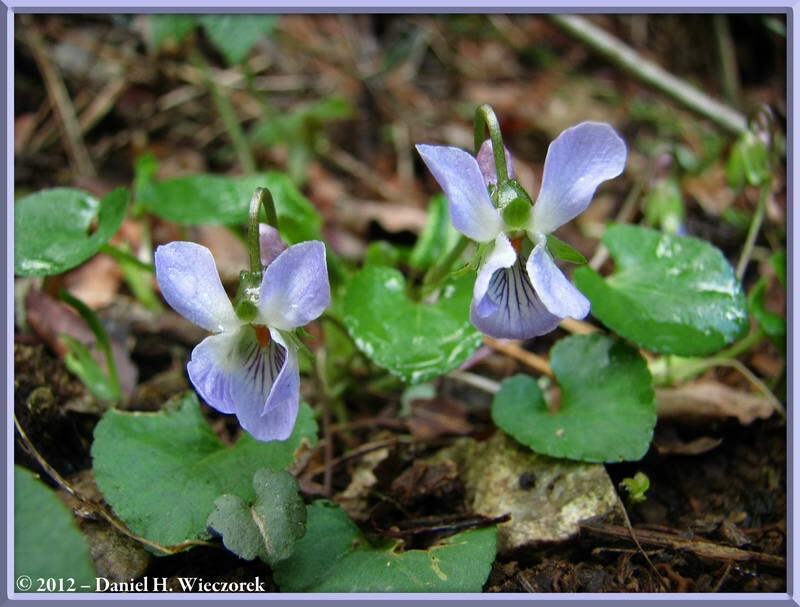 In this row is a shot of Viola japonica in first position. The 2nd image is actually 3 exposure-bracketed photos which have been combined into a single High Dynamic Range image, using the Tone Compressor Option of Photomatix Pro Software. 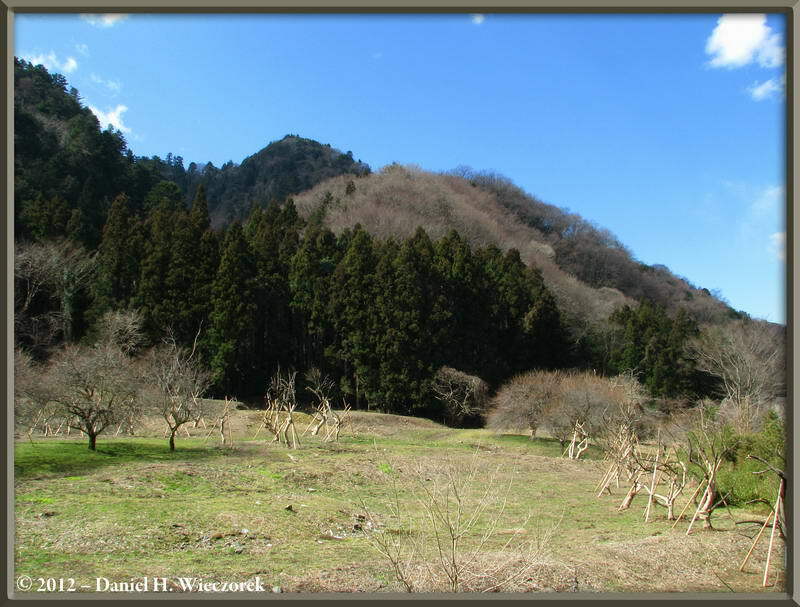 It shows the shelter at I-Ccho-Daira - we'll be taking a couple of photos from there in the following row. 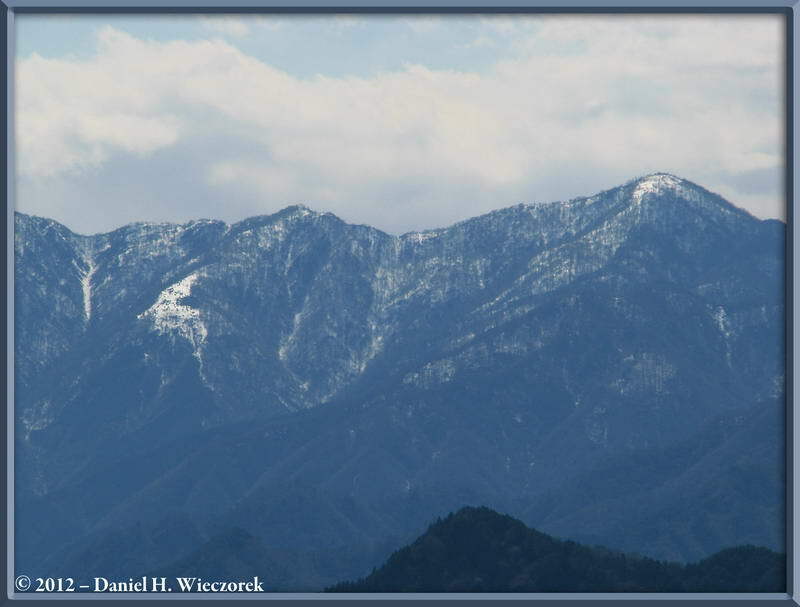 The 3rd shot shows a semi-cloudy Mt. 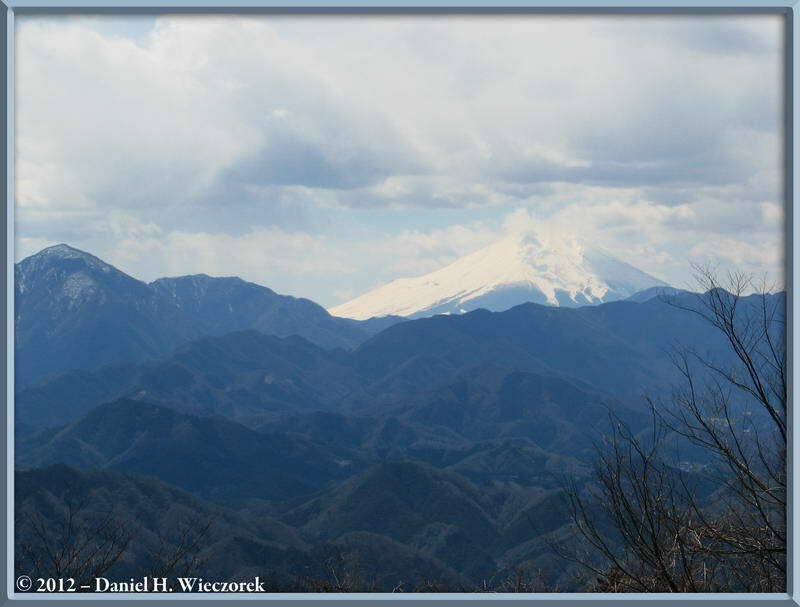 Fuji from the summit of Mt. Kobotoke-shiro (670 m = 2,199 ft). Usually at this time of the year the air is filled with Cedar Pollen, giving it a very hazy appearance, but this year there isn't so much pollen flying about - people with pollen allergies are smiling this year! 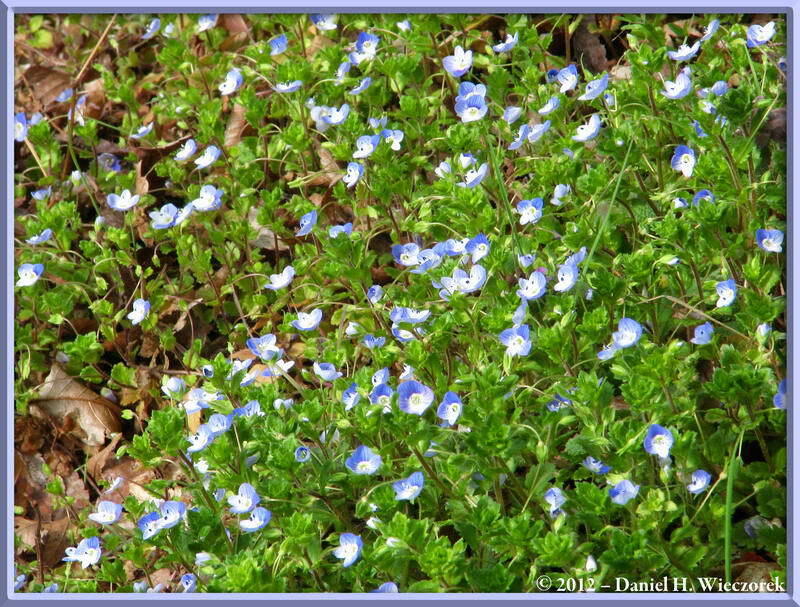 Here are the final 3 images from March. The first 2 were taken from I-Ccho-Daira (read Row 7 row text). That mountain over there is part of the Mt. 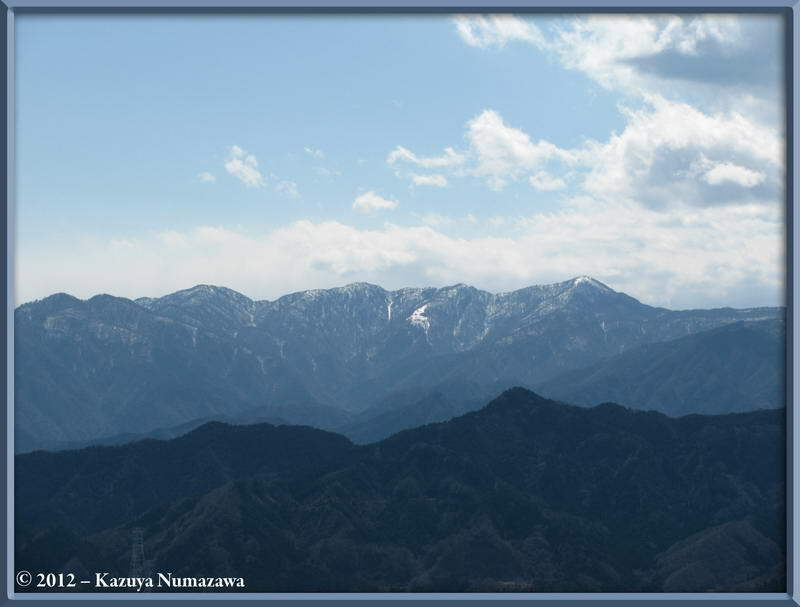 Tanzawa mountains. 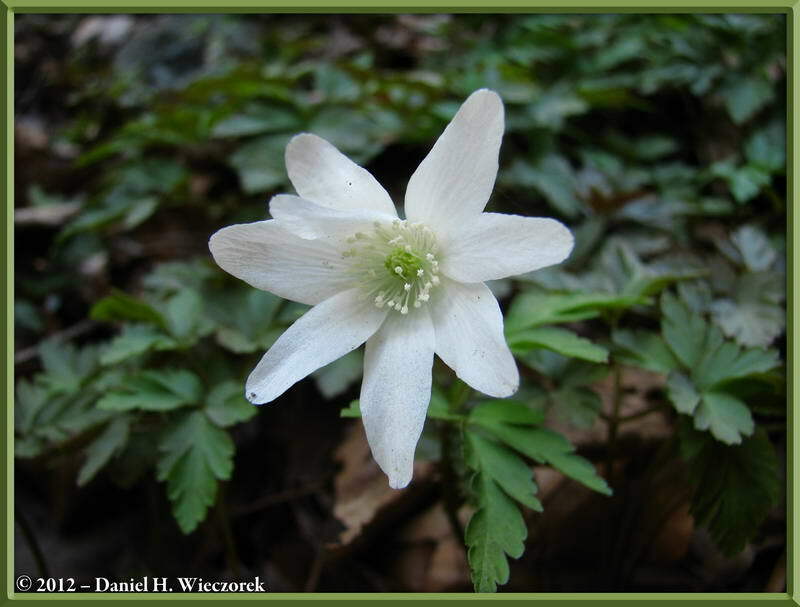 The final shot in this row is an Anemone raddeana flower which we found as we descended Mt. 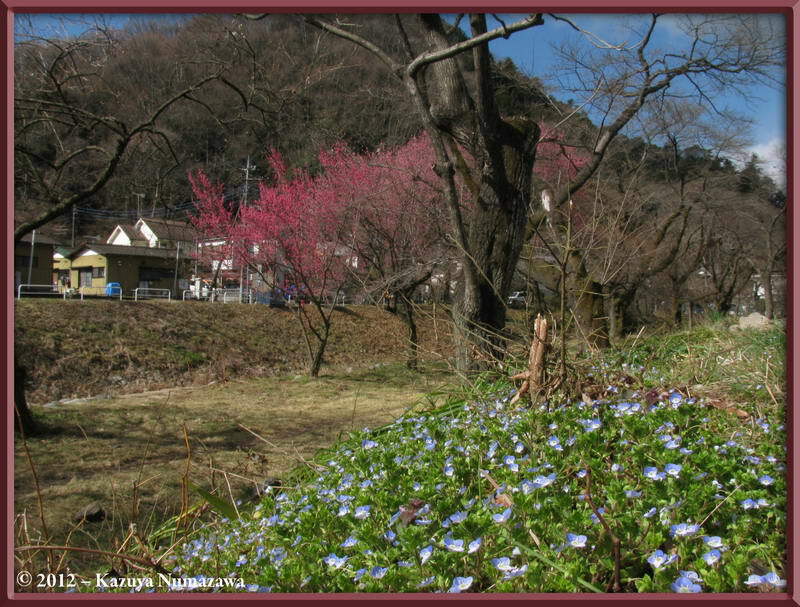 Takao towards the train station on Trail #6 (note that the photo itself is mis-labeled).